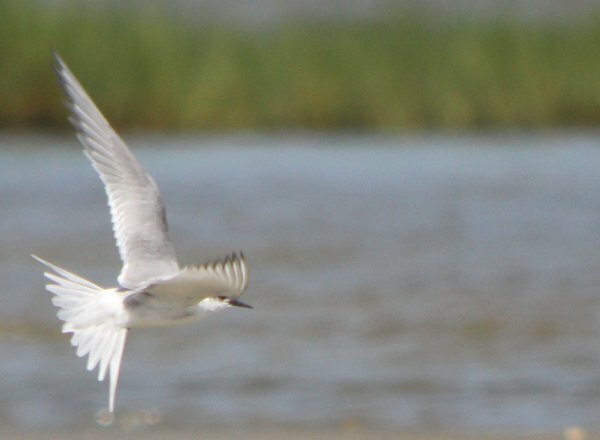 Arctic Terns are a rarity in New York State. But Sterna paradisaea can be found pretty much every year at Cupsogue Beach County Park on Long Island in very small numbers and only during the summer. 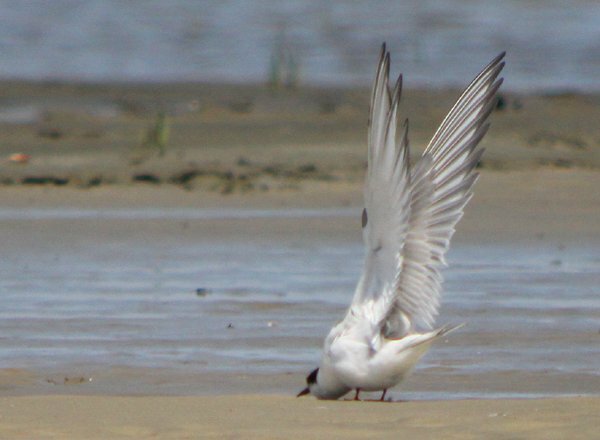 Shai Mitra has already done an excellent job on this blog of explaining the methods that must be employed to find and identify an Arctic Tern visiting Long Island during the summer, and many New Yorkers have since followed his instructions and found their own birds. A couple of weeks ago Seth Ausubel and I did the same out on the flats at Cupsogue. First we found the terns that were clearly not adults, but birds in either portlandica plumage* or 2nd summer plumage. Then we looked for other field marks that would indicate that we were dealing with Arctic Terns rather than the much more common Common Tern. The easiest field mark to use was the extremely short legs of Arctic Terns, though one must be careful because sometimes uneven ground can create the illusion of short legs. We managed to find two Arctic Terns this way, and had the joy of watching them for quite some time, long enough for us to call Shai and Pat Lindsay, who were birding elsewhere, and get them out on the flats to join us and see the birds as well. The pictures below are of the two Arctic Terns we found, both in portlandica plumage. All shots were digiscoped with my Canon EOS 50D through my Swarovski spotting scope. 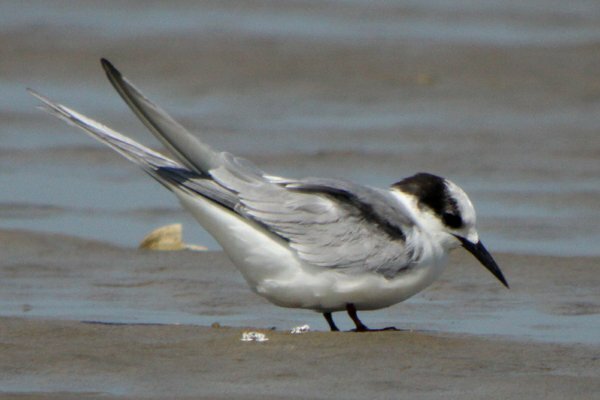 [T]he term “portlandica,” and also the term “second-summer type,” most accurately refer to aspects rather than to definite age classes, especially when they are used operationally (as we do here on LI) to cover species other than Arctic Tern (such as Common and Roseate, and even Least and Black). In Common Tern, for instance, it is alleged that some first-summer birds can be a somewhat advanced and resemble the “second-summer type;” that some second-summer birds can be a bit retarded and resemble the portlandica plumage; and that some very old adults come north in “second-summer type” plumage…Anyway, although many of the experts urge AGAINST using the term portlandica because of the ambiguity it carries, I like it because it clearly captures something people actually see–and it doesn’t cause the nausea and eye-rolling associated with the (often overly precise) technical language (e.g., first alternate = first-summer = second calendar year). tell me this place was in Queens and that hence my epic streak continues (http://10000birds.com/the-queens-list-wont-stop-growing.htm)?!?! “portlandica plumage” is *less* eyeroll-inducing than “first-summer”? I’m not sure I buy that 😉 Thanks for teaching me a new term, though. @tai haku: Sadly, no, I was in Suffolk County. Some day though! “Some second-summer birds can be a bit retarded”…first we discover birders are racist, now this????!!! Joking, of course. jmj–nothing is easy when it comes to birders and their eyes! A significant number of people see “first-summer” as referring to what is literally a bird’s first summer (i.e., the weeks after it fledges). This seems so obvious to some folks that they get genuinely confused when told that “first summer plumage” actually refers instead to birds in their second calendar year, when they are about a year old. If one adds in the imprecision in how people apply the term “juvenile” and consider how the calendar looks from the perspective of a trans-Hemispheric migrant (e.g., Arctic and Antarctic Terns breed on opposite sides of the planet during June and January, respectively, but socialize as differently aged teen-agers around the Antarctic pack ice), you can see how it is convenient to have a distinctive term for the distinctive terns shown above!